Inhaling essential oils is probably the easiest and most convenient method of application. It also carries the lowest risk of adverse reactions. 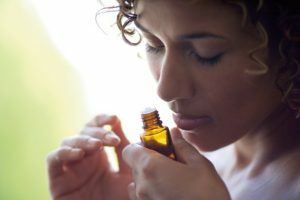 Essential oil vapours can enter our olfactory (smell) system via direct exposure (smelling from the bottle or a bowl of hot water) or use of essential oils in diffusers, vaporisers, the bath or massage. Essential oil vapours travel to parts of our brain where they can influence our central nervous system. Also, it is “known that essential oils are readily absorbed into the blood stream via inhalation” (Battaglia 1997, p.116). Essential oil molecules will pass through our respiratory system to the lungs where they will pass into the blood stream. So, whilst inhalation of essential oils could be considered relatively risk free follow these guidelines to ensure safe and effective use. · If using essential oils in a direct inhalation, such as doing a steam inhalation for a head cold, keep it to no longer than 15-20 minutes. · Having some fresh air in between diffusion of essential oils is always a good idea and adjust the quantity you’re using accordingly. Be aware of the size of the room you’re in and if windows and doors are open or closed. · I would recommend using lower quantities when vaporising around babies and children, people with asthma, sensitivities and chronic disease and animals. · Safety will also depend on the essential oil used. Some essential oils should be avoided in the groups mentioned above. I would recommend contacting a qualified aromatherapist for advice. The therapeutic effect of inhaling essential oils is often underestimated. A simple sniff of an appropriate essential oil or blend can have a profound effect on our mood and behaviours. Aroma inhalers with a personalised blend are fantastic to have on hand. Diffusing essential oils into the environment can help relax or revive, as well as purifying the air. Some essential oils are great air antiseptics making them beneficial in a sick household. Tisserand, R., Young, R. (2014). Essential Oil Safety-A Guide for Health care Professionals (2nd Ed). London: Churchill Livingstone. Battaglia, S. (1997). The Complete Guide to Aromatherapy. Queensland: The Perfect Potion.